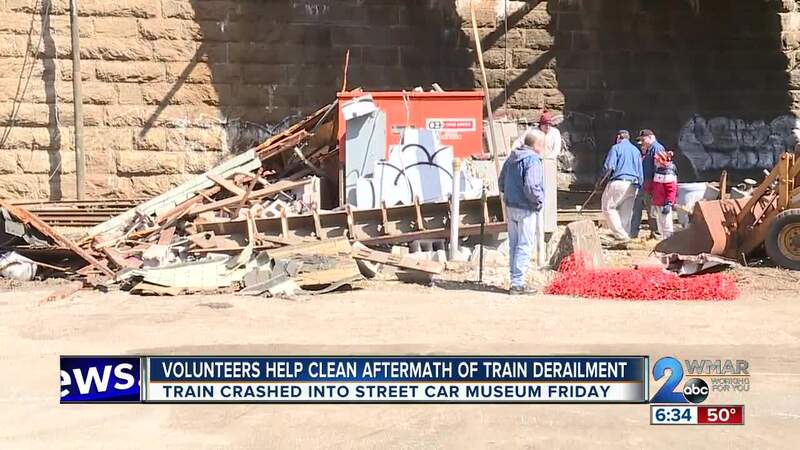 BALTIMORE — Nearly 48 hours after a derailed train came crashing down onto part of the historic Baltimore Streetcar Museum, several volunteers came together to begin the cleaning up process. On Friday afternoon, the museum's sub-station was severely damaged after a CSX train derailed and fell from an overhead bridge along Falls Road. The sub-station is primarily responsible for powering the museum's streetcars, and while the damage has certainly been done, the most expensive mechanics were luckily able to be salvaged. It was less than a month ago that the museum reopened for the season, and being that's its completely run by volunteers, makes it all the more urgent for recovery efforts to get underway. "There would be a lot of money and time lost where as if we save this we can probably be open in two months because they are gonna pay for everything, they're gonna build us a new building. They are gonna wire it back up when its all done they are gonna rebuild our track for us."